Towards the end of the 19th century English art was being influenced by artists from abroad, particularly from France where the Impressionist movement was becoming well established. An artist who had a great influence on an emerging group of English Impressionists was the American artist James McNeill Whistler whose travels between England and France brought the new ideas of art production directly from France to England. Throughout most of the 19th century artists were concerned very much with storytelling and minute detail. Whistler rejected this type of painting as did the Impressionists, concentrating instead on form, colour, light and tone. In 1886 the English Impressionists founded the New English Arts Club. Artists such as Fred Brown, Henry Tonks and Wilson Steer were members of this group and all taught at the Slade School of Fine Art. Consequently many of the students from the Slade at that time became strongly influenced by the NEAC. 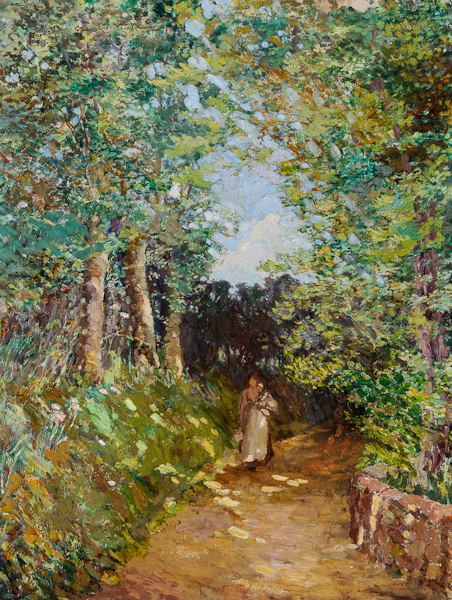 The sculptor, painter and lithographer Elsie Henderson, today best known for her depictions of animals, attended the Slade in 1903 and the influence of the NEAC can be clearly seen in her painting 'Figure in a Wooded Lane'. The loose energetic brushstrokes and her attention to the effects of light within the landscape are typical of Impressionism and the rather subdued pallet is typical of the artists from the NEAC, most notably Walter Sickert.